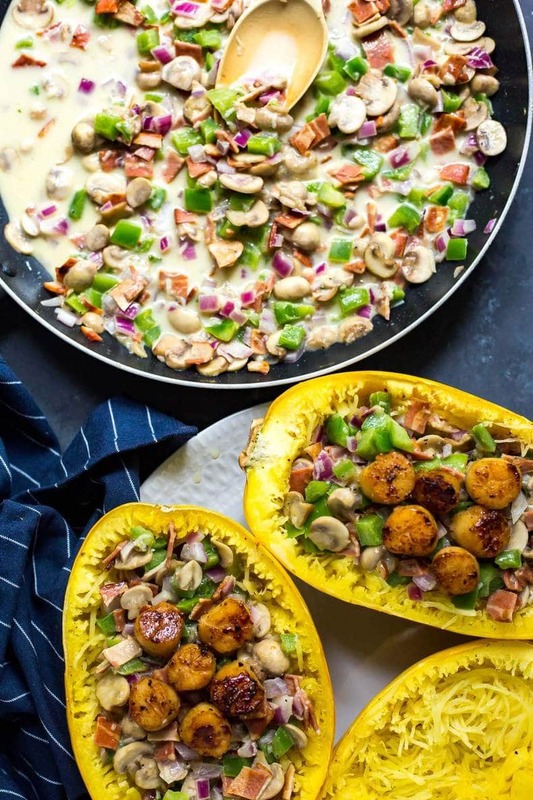 This Healthy Scallop Spaghetti Squash Carbonara is made with turkey bacon, peppers and mushrooms with a delicious cream sauce for an easy weeknight dinner! This post is sponsored by me on behalf of Marina Del Rey Foods. Thanks for supporting the brands I love – they help keep my blog up and running! I've got something to admit guys. I'm a certified pasta fiend. If left to my own devices, I would devour all kinds of pasta without abandon, every day. When you're a carb lover, it can be hard to control your cravings, right? Well, if you're a pasta addict like me, then this This Healthy Scallop Spaghetti Squash Carbonara is the perfect solution to your carb-induced problems. 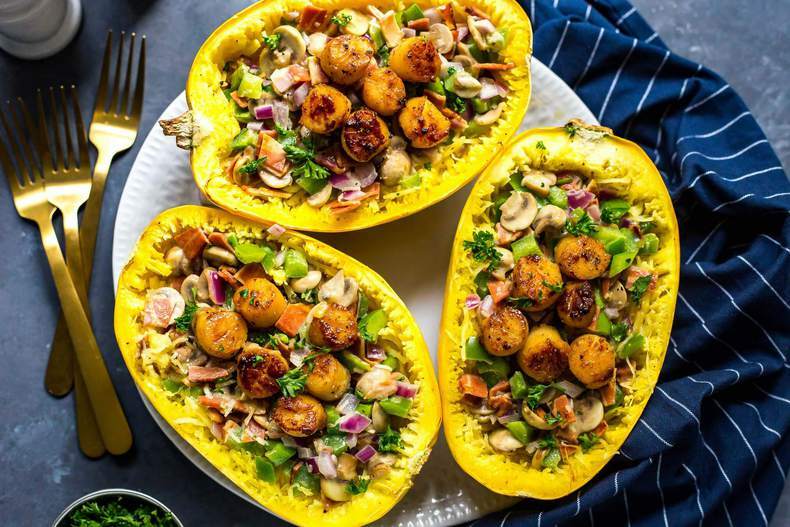 Spaghetti squash is super easy to roast in the oven, and has a texture similar to spaghetti or a delicate angel hair pasta – and it's a vegetable! A very tasty one at that. Throw in some healthy turkey bacon, add a delicious cream sauce and then top the whole thing off with SCALLOPS?! Umm, yeah you've got me sold. Say hello to one of the most divine dinners imaginable. And all this healthy comfort food comes together in under an hour! Okay, I have to admit, the sauce isn't traditional carbonara – more of a mix between a healthier alfredo and a smoky cream sauce. 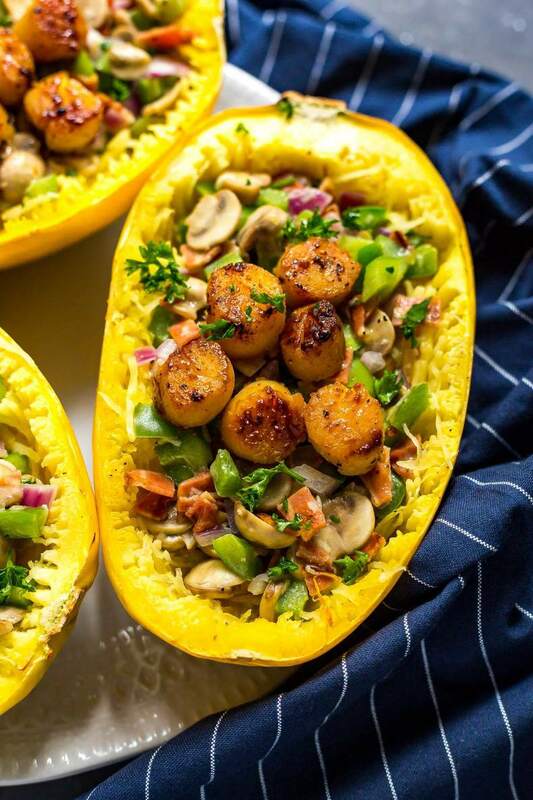 You only need a tiny bit of cream and parmesan to mix with the light crunch of the spaghetti squash, and the scallops add a delightful indulgence to the meal so you'll feel like you're enjoying a five-star dinner on a weeknight! I also love this Healthy Scallop Spaghetti Squash Carbonara because it's a great freezer meal – make the spaghetti squash ahead of time and pull them out of the freezer (or fridge), defrost in the microwave for a minute or two and then heat up in the oven for dinner after a long day! Then all you have to do from there is make the sauce and sear the scallops at the very last minute. I have to admit I'm obsessed with all things stuffed veggies these days. It's a great way to get a full serving of vegetables and enjoy great sauces, lean proteins, delicious cheeses and whole grains, and an easy way to cook for yourself as a single person without too many leftovers. 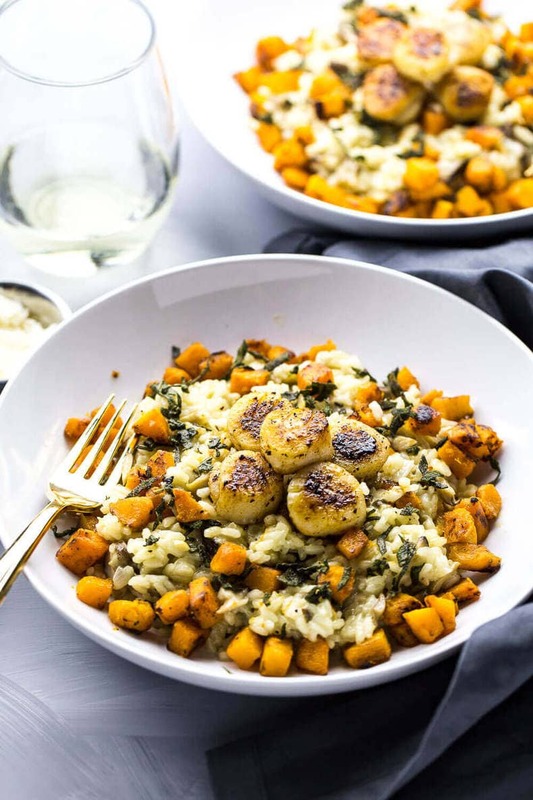 Every part of this recipe (from the squash to the sauce) can be made ahead of time so that all you need to do is sear the scallops at the last minute, which I find actually disguises the fact that you could technically pull this out of the freezer for dinner. The scallops elevate this Spaghetti Squash Carbonara to a new level, and makes the whole thing pop with flavour. And speaking of scallops, I am absolutely HOOKED on these Icelandic wild-caught scallops from Marina Del Rey, and they're SO EASY to cook! Don't you just love when the simplest, high-quality ingredients make such a huge difference in a recipe? 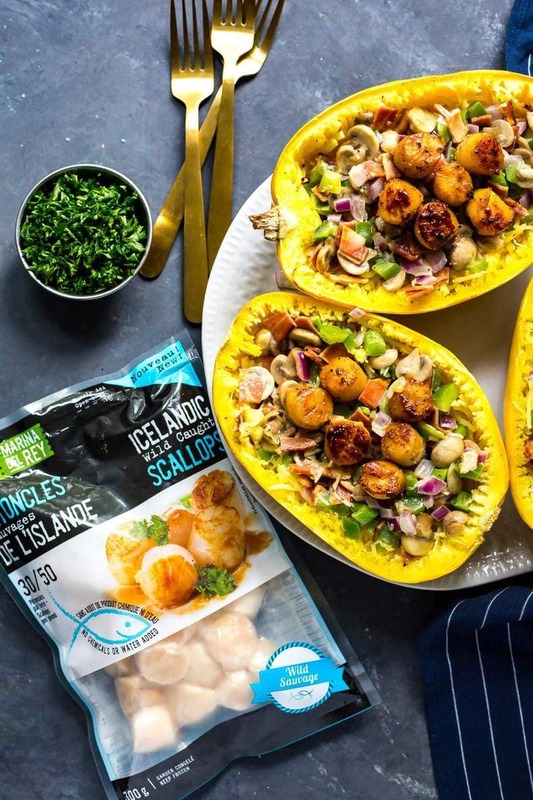 Marina Del Rey Foods sells responsible, wild-caught frozen seafood – I LOVE their wild Argentinean shrimp, and now I think I'm hooked on their scallops too! There's no water or chemicals in their products, and their wild seafood is also free from hormones, colours and other additives found in farmed seafood so you can rest easy knowing you've picked a delicious, healthy choice for dinner. The key to getting these scallops to cook perfectly is to sear them on high heat in a frying pan on the stovetop. Add in a generous amount of olive oil, heat on high until oil starts smoking (get that kitchen fan on by the way!) and then add your scallops after they have been patted dry and seasoned with salt and pepper. Sear for about 45 seconds to a minute per side, then flip and sear another minute or so. Remove from heat to a paper-towel lined plate and then top off your spaghetti squash carbonara with these delicious, tender sea scallops. They are TO DIE FOR. No extra seasonings needed beyond salt and pepper – just enjoy them in their own simplicity. Now this is fall comfort food I can get behind, like, every night. 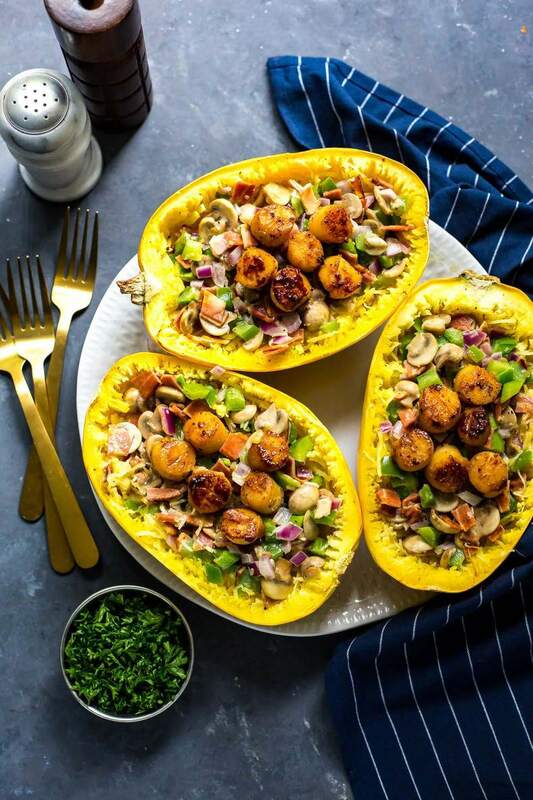 Scallops are high in protein, low in calories and rich in Omega-3s, so they're a go-to choice for me even beyond taste when I'm choosing what to have for dinner – I want something that will satisfy me, keep me full and complement the other healthy components of a recipe like this Spaghetti Squash Carbonara. 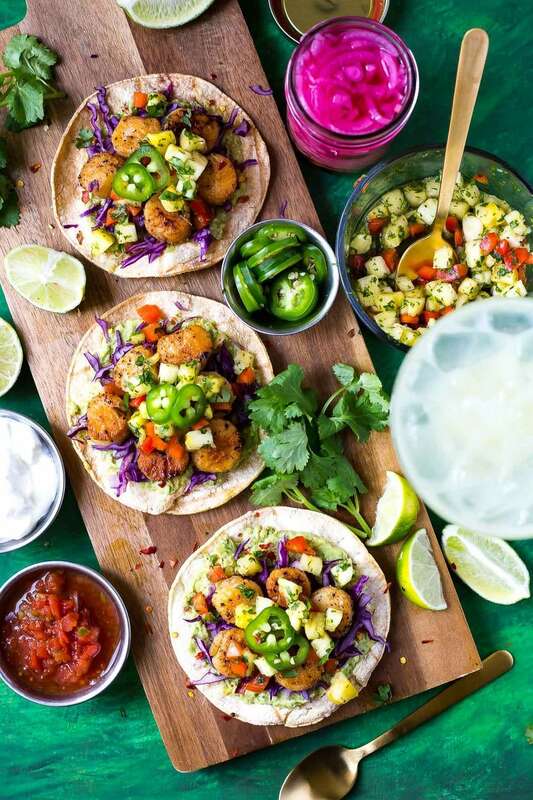 And as if all of this isn't exciting enough, Marina Del Rey Foods will be giving away some of their seafood products and a *wait for it, drumroll please…………* TRIP TO ICELAND! How incredible right?!!! You're definitely going to want in on this fabulous contest. For details on how to enter, please see below! 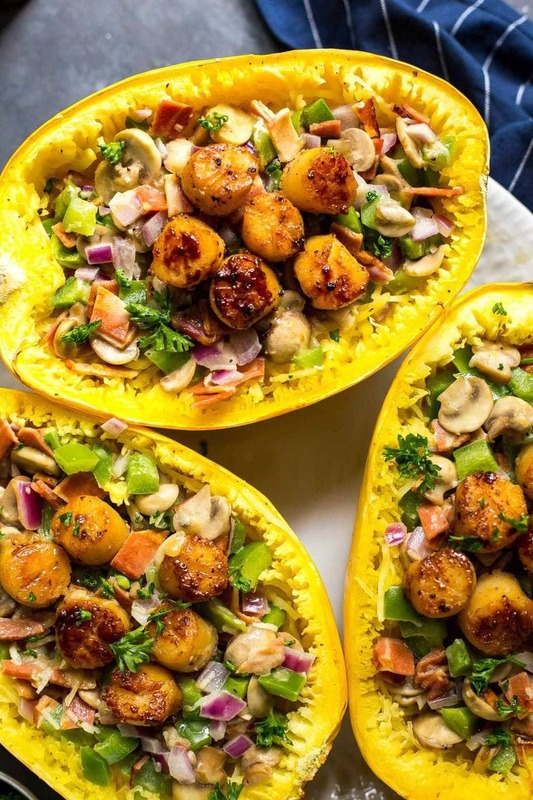 Will you be trying this This Healthy Scallop Spaghetti Squash Carbonara recipe? Cut spaghetti squash in half. If they are too hard, you can microwave them whole for 1-2 minutes to soften them until they are easier to cut. On a baking sheet lined with parchment paper, place spaghetti squash face down after covering them with olive oil. Season with salt and pepper and cook in the oven for 30 minutes. Meanwhile, heat olive oil in a large frying pan on med-high heat. Cook turkey bacon for 4-5 minutes until slightly crispy. Remove from heat. Without wiping pan clean, add more olive oil. Add garlic, sautéing for 30 seconds until fragrant. Add mushrooms and cook for another 5 minutes until liquid has released. Add red onion and green peppers plus salt and pepper and cook for another 1-2 minutes. Add flour and toss veggies to coat. Add broth, cream and parmesan cheese, cooking and stirring often for 2 minutes until sauce slightly thickens, then stir bacon back in. Remove spaghetti squash from the oven and when cool, scrape out with a fork. Pour sauce mixture overtop of spaghetti squash, stirring to combine. Meanwhile, heat olive oil in large skillet over high heat. When oil starts to smoke, add scallops and cook for 1 minute per side. Remove from heat to a paper towel-lined plate. Top spaghetti squash halves with carbonara sauce and 6-8 scallops. Serve and enjoy! I love serving this warm and hearty dish in the squash, and also like the healthy options. Looks wonderful! Thanks Kelly! I’m obsessed with spaghetti squash! Looks absolutely delish!! I can’t wait to try! I love a good spaghetti squash. Thanks so much Brittney! I always struggle with how to serve spaghetti squash but this dish is simple and easy! Thank you Jen! That really means alot! Yum! And such pretty pictures! This looks delicious Taylor – I love that you added more veggies to the traditional carbonara! Aww thanks for making it Kristi – so glad it turned out well for you 🙂 This made my day! Wow, this dish is so special, Taylor. I love the flavors and colours and the addition of my favourite scallops! I’m drooling over these right now!! The only good news is I’ll be making them as soon as I get home for dinner so yaaay for me!! Can’t wait!! I love my carbs too, but spaghetti squash makes me forget all about them! This meal looks every bit as hearty and I love all of the goodness and flavor that you’ve packed into this dish! I’m loving the flavors, the colors, everything about this gorgeous dish! Marina del Rey makes the BEST seafood! 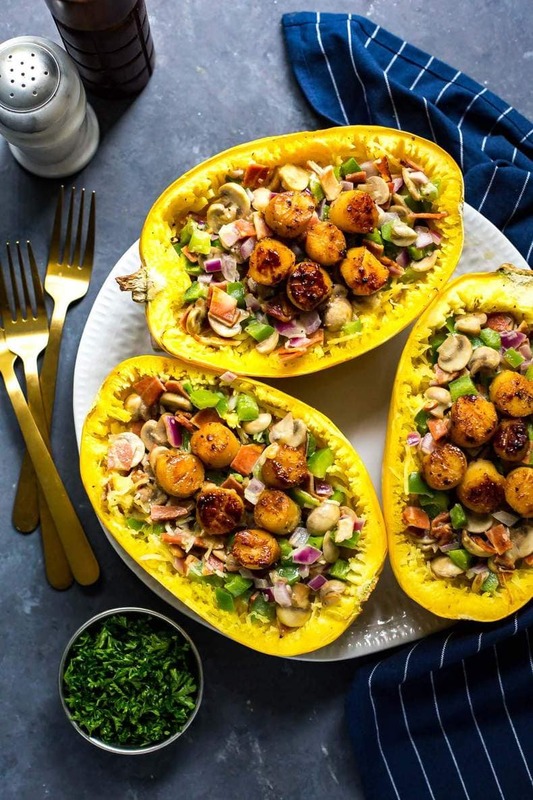 Loving this sassy veggie-packed scallop spaghetti squash! 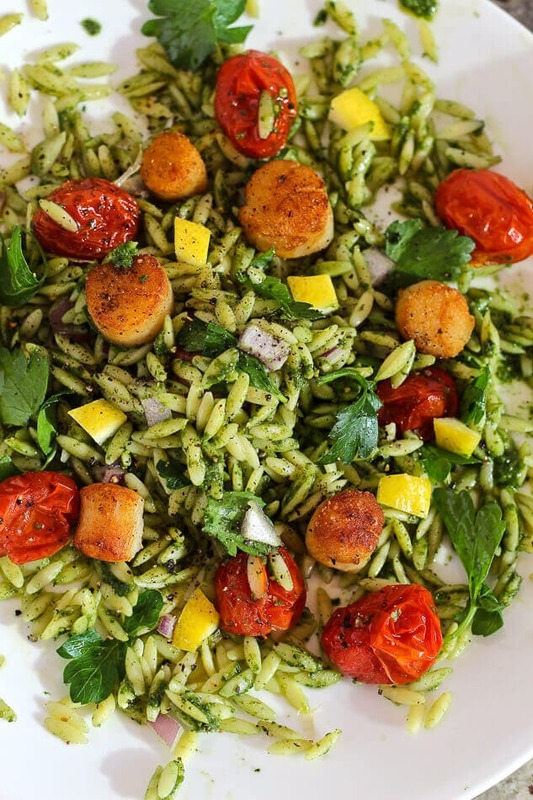 Such a great recipe for tasty Marina del Rey scallops – YUM! Wow! I am loving EVERYTHING about this recipe! The colors, the flavors, the scallops… Irresistible! Such a creative meal! Loving all the colours and flavours here and of course, those beautiful scallops on top! 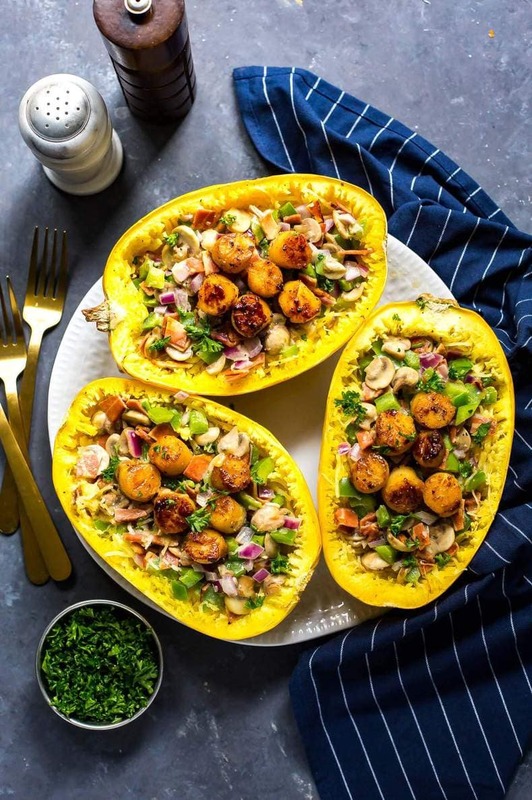 We love spaghetti squash and this must be a terrific combination. We love these scallops and all the Marina del Rey seafood. This dish seems so simple and clean – love it! This dish looks so delicious! I love scallops and this recipe. So healthy and yummy! I love the colors and flavors of this recipe. This recipe is going into my list of guilt-free hearty meals. Such a beautiful recipe! Those scallops look amazing!! I love how you made a healthier version of scallop carbonara with spaghetti squash! The presentation is so impressive! I know you posted this several years ago but it was delicious. I notice you left the scallops off the ingredient list, and didn’t mention adding the cooked bacon back in. It wasn’t hard to figure out but newer cooks might be confused. I would make it without scallops if I had to but they were elevated the dish. Thanks!